Today was the annual Art Walk in Belmar, an occasion for local artists to set up all around the downtown area, demonstrating their skills and possibly selling their art. Since at the moment I am attempting to run my local woodcut class again, I figure self promotion is not a bad thing. 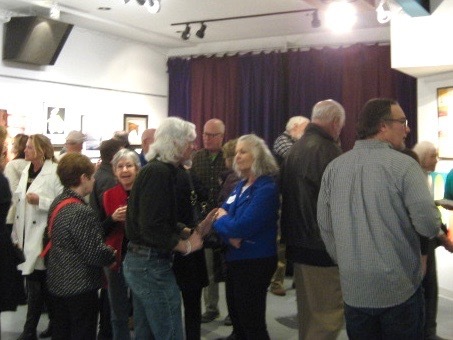 The event had been run by a private business for years, but a few years ago it was handed to the Belmar Arts Council to organize. They offered me a slot inside, in our building, which is generally better than exhibiting outdoors, and like I said, I have a class to promote. My shift was scheduled to begin at noon, and I was there on time. But before I could set up for my demonstration I had to deal with something else first. Besides running the Art Walk, we are often invited to run a lot of other arts events and/or to provide artists and artworks. For example, last year we handled a show for Spring Lake, held in their Library/Theater building. Today I was dropping off work for another. 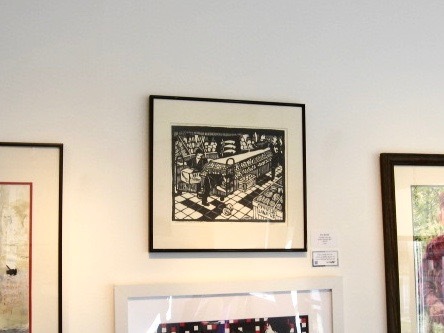 Many corporations run art galleries- years ago the Printmaking Council had a deal with one such local (to them) space where we provided shows (traveling ones we had held in our gallery) and they donated to the group for each one. Apparently New Jersey Resources (large energy conglomerate) has been inviting us for years to put together a show and we finally agreed. I'm usually not crazy about these corporate campus things, but, again, promotion. There will be no reception, though I am told it is open to the public during business hours. When I find out more, I'll share the info, as well as see the show itself. (my town, should be easy to get to) Today was the deadline for dropping off work in Belmar, which organizers will be installing soon. 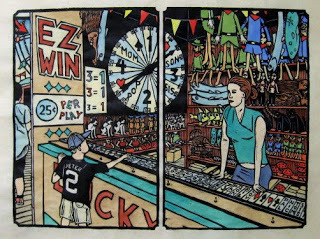 As far as the Art Walk- I had the opportunity to recruit people for my next attempt at a woodcut class, as well as a need to produce a new print. One of their summer theme shows in Belmar will be about birds, but works must be more recent than any of the bird subject prints I have. I had considered reworking an old saint print, since so many of those blocks were destroyed by Sandy, and had even picked out a possibility, and then a new niece was born this week. Nothing under her name in my main resource, but my brother tells me there's info on the internet. I'll want to get more verification before I make this print officially part of the set, but I can still make them a print. An internet search did turn up a Saint Georgia (my new niece's name) but very little else. Maybe she's one of the many saints canonized by John Paul II, too recent for the books. Most of the websites that list her just give the name and feast day (Feb 15) but no stories. The one page that did provide a story mentioned that during her funeral, birds followed the procession through town and settled on the roof of the church for the length of the funeral. It's the kind of story I would work with anyway, even if I didn't have a need for another bird themed print, but this will kill two birds with one stone (so to speak), maybe three if you throw in the need to promote the class. Over the past few days I came up with a plan, gathered resource material, and during my Art Walk shift I started drawing. My idea is a church roof with doves (the bird from the story) all over the roof. I selected a church from one of my many art history books, had images of doves from wild life books, and started sketching. The one thing I didn't have was a decent pencil, just some mini-golf pencils left over from what we use for classroom evaluations, but it was enough to start the sketch. Needs a lot more content, but at least I got it started. Thursday is a day between classes, so a day I typically go to the Studio. And at the moment I have a few projects going, so I don't want to waste a good studio day. One of the projects is the coloring of the two boardwalk prints that have been ordered, so today I continued on that tattoo print. My plan had been to take on the blues, the biggest color group I had left, but that's going to be complex and I wasn't sure I had time to get all that done. I did handle one blue today, the indigo that I used for the tattoo artist's overalls, and on some of his tattoos. And I added plenty of browns today- the hair on the main two figures, her belt, hair of one of the figures in the background, and some of the tattoo needle. These are all dark colors, adding some high contrast to the image. Save those big blue sections for another day. Another task dealt with today was a sculpture in wood. 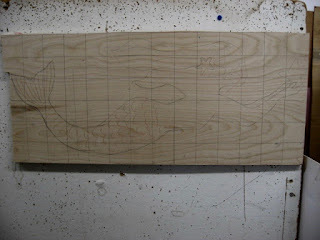 Several months ago my brother's wife had requested a wooden relief sculpture of a mermaid, something that would eventually appear in the new baby's room, but since that baby wasn't due until May, I hadn't done much yet, other than collecting from her an image of what she had in mind. And then the baby came a week early, but all is well. I figured I would be paying a visit anyway, so it seemed a good time to get it started and get some guidance. 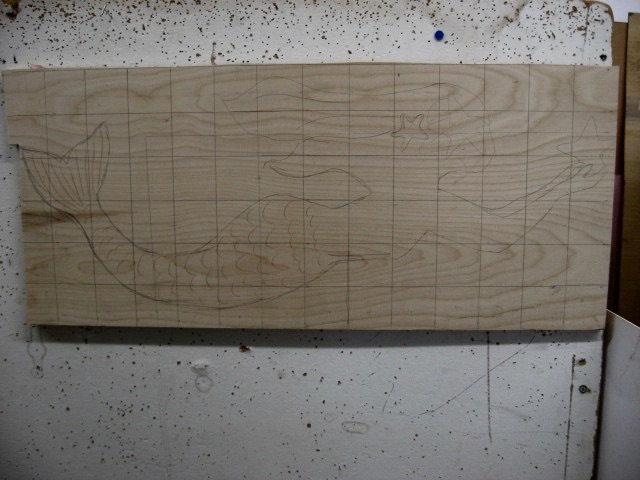 I had to buy more wood anyway for my Belmar class, so I was able to cut off a big chunk of the wood I had for the mermaid. Last night while at school I gridded the inspiring art and the block and transferred the figure to the wood, and today at the Studio I trimmed away the excess. Late in the day I stopped by to visit the newest Bonelli and brought the mermaid with me to get some input. She approved the size, and given the option of cutting it out as silhouette or keeping some wood around her to represent water (and things floating in it) she chose the former. For their first two children I produced saint prints, going with saints chosen for the name, as opposed to the birthday/feast day that I have occasionally been asked to do in the past. The problem is that the newest child is named Georgia, and the index to the edition of Butler's Lives of the Saints that I own and use for my saint biographical sources has not one under that name. But today my brother tells me that the internet lists one, so I checked in the evening. Google search did bring up several mentions of a St Georgia, though there is relatively little information, or sometimes none. The one bit of story talks about how at her funeral a flock of doves landed on the church roof and stayed all day. And here I need a bird image to work on for my woodcut demo on Saturday. I now have two days to scare up any other details I can find, come up with an interesting composition and draw it, so I can begin cutting it on Saturday. I have an idea, but I'll save that for the weekend. The weathermen who predicted heavy rains for today, and gave me a reason to buy wood yesterday, actually got it right. Morning sprinkles eventually gave way to heavy rains in the afternoon. Not that it affected my plans, since I was going to be going to the Studio, which is an indoor activity. Got a later start than I had expected, so I only got to part of my plan, and used the time for some school related stuff. After a break of a few years, I'm back to teaching Intro to Art this semester at my university, and a project that I always do with that class is a collagraph project. The beginning of that word refers to the idea of "collage", and the printing plates are made by attaching materials to whatever you are using- no carving, acid, or any of the other fun stuff. 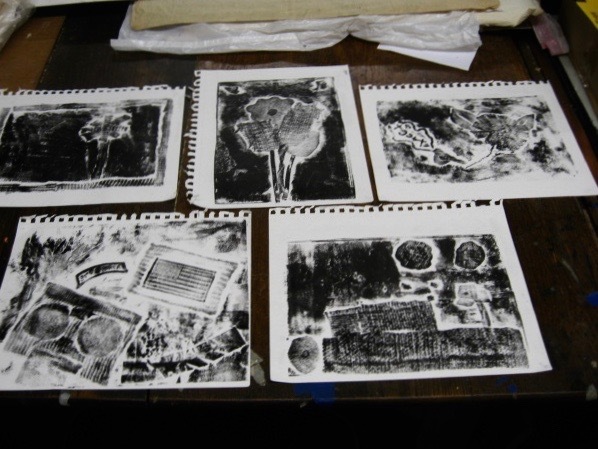 I first learned of the process while a grad student at Montclair, and we were shown processes involving silkscreen fabric, and carborundum grits. 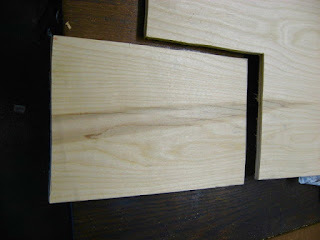 I paid attention to the demos, but continued cutting wood. When I was given the Intro class years ago we were given little instruction, so I put together a basic arts class covering the main formal concepts and basic processes. Being a print guy, I always try to get a print process into whatever class I teach, so my 2D classes usually do a woodcut, my drawing class does monotypes, and the intro class gets to try a type of collagraph. Back when I started the Design classes were also there in the building, and every year they would leave piles of old materials in the hallways outside their classrooms, including lots of cloth samples. And so I developed a type of collagraph print using cloth textures. I don't know if those interior design classes are still in our building, but I still have a supply of those cloth pieces, so I put them to use this year. So one day I gave a lesson on the history of printmaking and they made the plates using my supply of cloth and cardboard from cereal boxes, with the option of adding other materials later. Two weeks later I had them bring in the plates and I printed them, providing ink, brayers, etc. Of course, some students missed that day, or didn't bring their plate back in, so didn't get a proof. Normally when a student misses a class it's on them to make it up, and as long as it's by the end of the semester they can get the full credit, but most Intro students have no printmaking experience or access to the materials and tools. But because I love printmaking so much, when students miss the printing day I will collect the plates, print them at home, and bring them back, as long as they get them done before the last day. Two weeks ago I received one plate, and last week I got four more, enough to make it worth doing. So today I brought those 5 plates to the Studio and pulled a proof of each. Image at the top of this post if you want to see the results. Used water based ink, so they'll all be dry and the students can get them back on Friday. Not as sunny a day as yesterday, but no problem as it was planned to be a Studio day. Got there in the afternoon. The first thing I took care of was preparing a new block of wood. 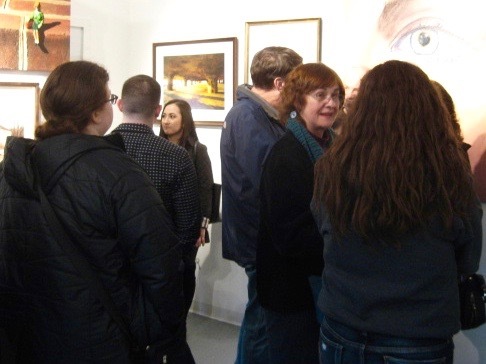 Saturday is the scheduled day for the Annual Belmar Art Walk, where artists set up all around town to show their work or whatever. I agreed to be manning the Boatworks, so I'll be cutting a block. 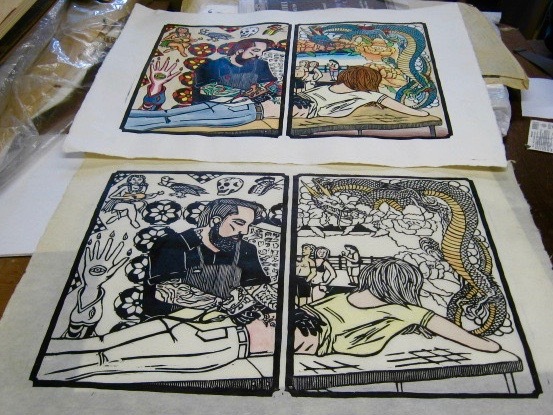 First, it's a chance to promote the latest scheduled woodcut workshop series. My last attempt (April/May) only got one taker, not enough to run. So now we're trying a June/July class. And we're hoping that people actually watching me do some block cutting might be more likely to want to try it themselves. 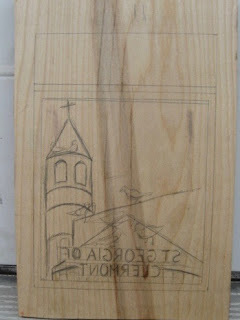 Second, this block will be used to start a saint print. One of the shows there later this summer has a bird theme, but a rule that the art must be created in the past few years. I've done a lot of bird themed prints in my life, but none are that recent, and probably all the ones I've done have been shown there already anyway. So starting a new bird themed saint print could take care of two problems at once. And the first step is preparing a piece of wood. Then I went back to my coloring. Didn't cover quite as much paper today, but what I did made a big difference. Today was greens- a warm lighter one for the leaves on the big flowers, the eye on the palm of the hand, and the ends of the grass skirt, a darker cooler green for other parts of the skirt, and for the tattoos on the artist's arms, and a pale green tint for the claws of the dragon, all hues matching my final version of the print from a few years ago. As I was leaving in the late afternoon I took a side trip to buy more wood. Didn't absolutely have to get it for today, but I expect to need it soon. And though cool and cloudy today, at least it wasn't raining, and there's no guarantee there will be many rain free days in the next few weeks. Water is not a friend to wood. As I was leaving the Studio, the parking lot that had been empty when I arrived was now jammed full of cars (dance kids likely), so rather than go back and fight for a space, I left it in my car for now. It will be safe in there. Long range forecasts had called for Saturday being the one sunny day among the next several, so my plans for today were to cut the rapidly growing lawn at my parents' house. But when I woke up this morning I looked out the window, and while it wasn't raining at the moment, it had rained a lot and the ground was very wet. Cutting the lawn while it's very wet almost never works out. Now they say that Sunday will be the nice day. Seemed like today was a day to do something indoors, so back to the Studio to continue with my coloring project. I had left off at yellows and off-whites, but today I could finally get to some bolder colors. Various orange tints were used for the ukulele girl in the upper left corner, and the large flowers around the dragon on the right side. 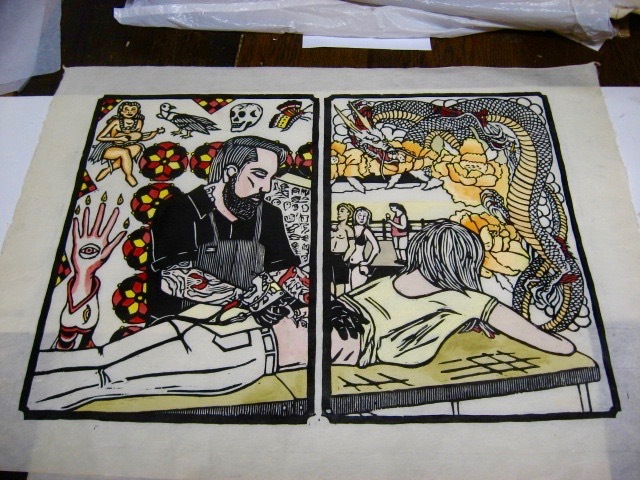 Then on to red, used in various parts of background artwork on the left side (plus the art on the tattoo artist's arms), and some details on the dragon. The additional colors make the piece a lot more interesting than it was on my last visit. Next time will be even more wild, as all the blues and greens make an appearance. Will get to browns and dark grays after that. 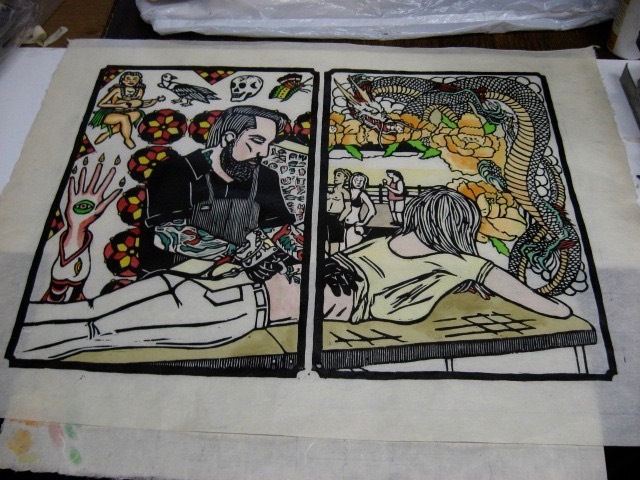 If all goes well, coloring will be done within a week and I can start coloring the other one I have an order for. Another sunny Tuesday- seems like a good day to get up to the Studio to work on this boardwalk order. Last time I had brought with me a prototype of this print on heavy white paper. I was confident that the colors of most of the objects in the proof were right, but I wasn't sure about all the background pieces. 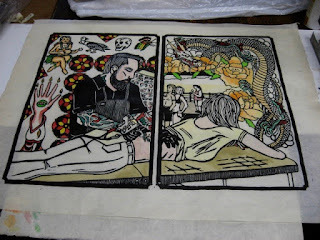 Today I had a copy of the print on the Japanese paper used in the edition- same paper I printed these new ones on. Early afternoon, so only a few cars in the building's lot. Wasn't until after I got out of the car that I noticed the iron gate over the main door was locked. But it looked like a large piece of paper was hanging on the door itself, so I got closer to look. A big note telling us that the door was locked while some work was being done, but the side door was open. Access to all the stairways leading to the basement was blocked, but not the elevator, so I took that down. 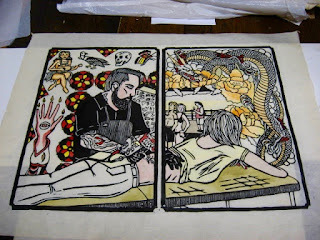 Still sticking with the light colors today, so a beige color for the table, a pale yellow in parts of the sky seen in the background, some deep cadmium yellow in some of the designs seen behind the tattoo artist on the left side, and a lighter cad yellow on parts of the large flowers around the dragon on the right side. It's a slow process with this very light paper, but having a proper one to work from does speed up the process. And I was right, some of the colors are different in this one from the first prototype, so I'm glad I had dug this one up before trying to color some sections of the print. Next time I get up there, some other colors will start appearing. I've been teaching 3D design for several years now. With a few exceptions, I give assignments in general terms, and let the students decide the subjects for themselves. One thing I have found is that, given a choice, most students tend to gravitate toward images of animals. In a project where students make use of pulp cardboard coffee trays as a material, last year I had a student turn hers into a pig, or at least the head of a pig. 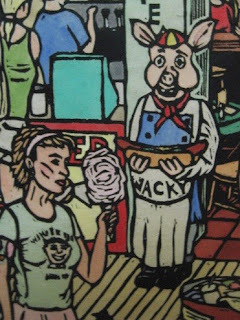 I thought it had a strong resemblance to a comic book character I helped to create, Wacky Castrated Pig, and so I brought in the original mini-comic to show her. This year, same project, and another student did a pig sculpture, though this one was a more naturalistic pig representation. So I brought in WCP #1 again, and that's when I realized something. My fellow comic artist and co-producer of the comic David Lasky included the precise date of production on the book in the copyright statement. The official publication date was April 15, 1992, which means today is the 25th Anniversary of that first issue. The character was conceived in a dream in 1986, a dream in which it had become a worldwide sensation, which never quite happened. There were 3 or 4 issues of the home produced mini comics, and the above cameo appearance in one of my boardwalk prints. 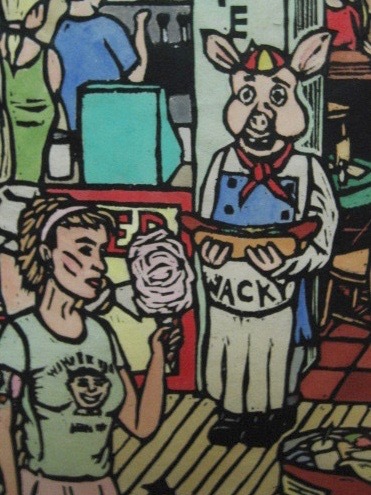 That print was in a show for 3 months earlier this year, which led to an order for that print, so while Wacky never became the hit I dreamed (literally) he would be, he's still out there working for me. Weather is still all over the place lately, but today was a true spring day, almost a summer day. My original plan for today was to be preparing for the first day of the latest round of woodcut classes in Belmar, but with one day to go I had just one student, which is not a practical class load. Yesterday we made the call to cancel the class. So with spare time and a beautiful day, I decided to go up to the Studio and continue with my boardwalk reprinting project. Did the printing for these new ones a few weeks ago and finally getting to the coloring phase. The sunny, dry, non windy conditions (a rare thing this year) made it practical to carry my prototype copy of the Tattoo Studio print to the car, and to the Studio. The new proof was already in the Studio. I always start coloring with the lightest colors, which goes back to the way I was taught to do watercolors. Today I put in some skin tones and a few other light colors. 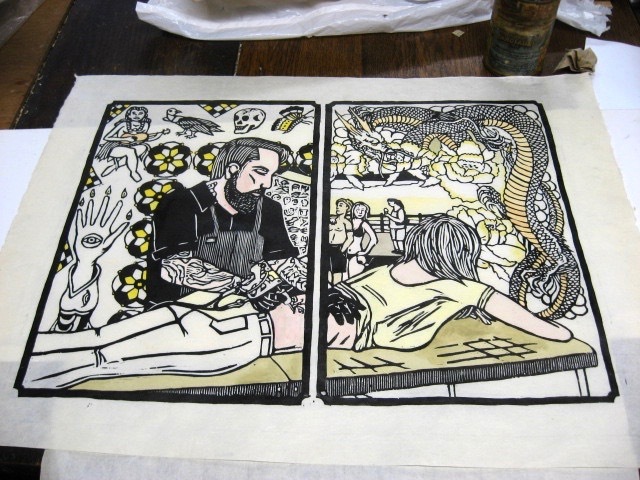 Some lemon yellow mixes on the woman's shirt, some naples yellow mixes for the guitar and the ventral surface of the dragon. My prototype piece has much in common with the final version, but I realized there may be a few differences and it's been years since I created them, so I should check some things on the final version of the print before coloring any more sections. Saw some surprising, almost shocking news in the latest issue of the Alumni Magazine that arrived this week. The average person probably wouldn't think much of it, or see it as a problem. I don't necessarily think it's a problem either, but it is out of character. The university president's column was devoted to changes, recent and coming, to the art/art history department at the College of William and Mary. Some, like the expansion of facilities around Andrews Hall (main building) and the Muscarelle Museum have been in the works for a while and are much needed. Not the first expansion- back in the 90's some studio classes and facilities were moved to a new building out by Lake Matoaka, one that didn't exist in my student days, but I got to tour it when doing a campus visit on my way back from a stay at an artist colony across the state from there. But the original building had no major updates and these changes are due. The surprising news is that a new subject has been added to the art program- photography. The average person might find it odd that there were no photography classes to this point, as I did back when I was a student there in the 1980's. I even asked our then chair, Professor H.E. Coleman (or the Coach as some of my friends used to call him) why this was the case, and he told me that they were of the opinion that photography wasn't as much art as it was a part of journalism, and I knew that the college did not believe journalism was a suitable subject for a major (a presentation I attended on interdisciplinary majors was very specific on this topic) No journalism, no photography classes were needed- case closed. If this all seems odd, it's because you don't know the College of William and Mary. Founded in 1693, they are one of the oldest institutions of higher learning in this country, and argue that they are the first true university in America, with the addition of other "schools" to the college in the 1700's. W&M alum and then governor of Virginia Thomas Jefferson decided to revamp education in the state, including creating the University of Virginia, and adding programs and faculty to William and Mary, beyond the original scope of the charter. This included Carlo Bellini, imported from Italy to be the first modern languages professor in America and namesake for the Italian Studies House I was a part of for 3 years, and what they claim is the first ever college fine arts program beginning in 1779. This was never stated officially, but I realized that no art process that developed after 1779 was taught in the Fine Arts department my student years, including such (relatively) modern forms of printmaking as silkscreen and lithography. The school values its 17th century history above all else. Which doesn't mean there still aren't some weird things with this. The column mentions this program comes with an associate professor, a dedicated classroom, and a darkroom, with plans to add a digital photo lab in the near future. Right now I teach at two colleges that had popular classes in film photography and darkrooms (3 or 4 sections per semester, all filled) and couldn't wait to banish them from their campuses, even as there were still majors working on their degrees. (some of those faculty are still employed, just not teaching film photography any more) At my current schools, it's just all digital now. Of course, both film and digital photography were developed after 1779, so maybe they have some things to work out. Things have been kind of crazy around the Studio building of late- St Rose is using the theater spaces in preparation for something, overrunning the building at times. With that in mind, I decided to get up there a little extra early today, well before the time I might normally get up there for the monthly critique. I have plenty to do, and some of it can and should be done there. Shortly after my arrival I was surprised by another- Molly. I hadn't seen her in that building in months, though I did know she was working sometimes, as I'd see evidence in our space. And it was still about three hours before tonight's critique was scheduled. However she wasn't going to stick around that long. She was reapplying photo emulsion to a screen (previous attempt hadn't worked), and then storing it in the usual safe dark place to leaves them to dry. And then she was gone. 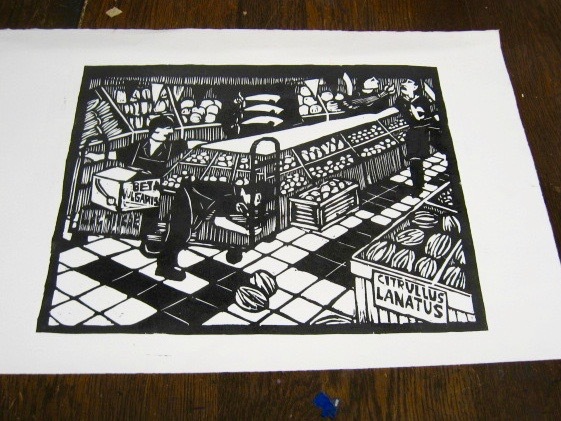 Meanwhile I got going on my main task for the afternoon, pulling another proof of the most recent supermarket print. This is the third proof so far, after the initial test proof and the first editioned proof, now in a frame and hanging in Belmar. Today I was filling an order, someone who told me of her intention to buy the piece, and since she made good the last time she did this, it was definitely worth getting the proof pulled. Left it in the rack to dry, cleaned up, etc. At critique time I was the only one there. Half hour later I was still the only one there in the Studio, and decided that was unlikely to change. So I put everything away and headed home. What does this mean for the future? Not really sure. At the time I was locking up, I was thinking I was unlikely to host any more of these any time soon. None of the people I had sent information to had replied, positively or negatively, and last week Molly told me she has no plans to come for the next few months. But when I got home tonight I found I had two replies that had come in after I had left for Ocean Grove, but well before the official start time. I'll have to think about it. This is the biggest BAC show of the year and always draws a large number of entries, as well as a large turnout for the reception. There are 84 pieces in this year's show, and if most of the artists show up, and if most bring someone with them, you get the idea. A lot of familiar faces, and a lot of new ones too. Did spend a little time talking up my next woodcut class, which will begin in about a week and a half if enough people sign up. Several of my past students were there today. Also represented in this show are people I know from the critique group that meets in the Studio. One of the award winners in today's show was Guido Guazzoni, who had been a regular in our group years ago. He seemed happy to see me tonight. 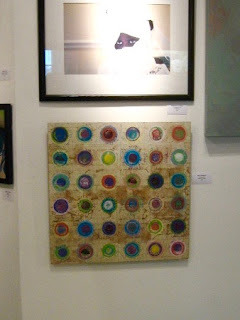 Below is another piece I found very familiar. I knew this work because the artist, Mary Gambarony, had brought it one of our critiques earlier this year. She wasn't sure where to take it from what she had done. The group consensus was that it seemed pretty complete, and so much of our discussion was over options for display. It appears that she went along with our advice and kept it as it was. Didn't win a prize, but did make the cut to be part of the show, so what we said couldn't have been too bad. Would have been happy to talk to her about it again tonight, but I never saw her there. No awards for me this year, but I've won at this thing a bunch of times, so maybe it's best if some other people get a chance.